It’s time for meteor watching! Did you know there is a special a day set aside to watch meteors? Well, there is such a day, and although “Meteor Watch Day” (June 30th) has passed; it’s never too late to get out your blankets and hope for some clear skies! Technically, many meteorites enter the Earth’s atmosphere every single day and, to see them, all you need to do is find a dark sky away from city and suburban lights. 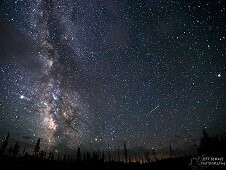 There are quite a few dark sky parks in the United States for your meteor watching convenience, including Oracle State Park in Arizona and Death Valley National Park in California. Meteor Watch Day leads us into July and August, which are two of the greatest meteor watching months of the year. If you’d prefer to go outside only when you know for a fact that there will be meteors to see, there be will a Perseid meteor shower in August that will be the most viewable if you live in the Northern Hemisphere – this means if you live in the United States you’ll have an opportunity to view this spectacular light show! Our vast knowledge of celestial events (like meteor showers) that occur in our universe is all thanks to space programs like NASA. Its most recent endeavor of space exploration was the unprecedented mission of the New Horizons spacecraft flyby of Pluto. The U.S. Government Bookstore offers many publications to give you more information on NASA, celestial events, and anything else you’d like to know about outer space. Astronomical Phenomena for the Year 2017. This booklet, which is free in PDF format, is published by the U.S. Naval Observatory and Her Majesty’s Nautical Almanac. The informational booklet includes information such as: Dates for Solar equinoxes and solstices, phases of the Moon, dates for various planetary phenomena, visibility and magnitudes of the planets, the equation of time and declination of the Sun, sunrise/sunset times, and much more. Commercial Orbital Transportation Services: A New Era in Spaceflight provides a history of the NASA Commercial Orbital Transportation Services (COTS) program executed by the Commercial Crew & Cargo Program Office from 2006 to 2013 at the Johnson Space Center, Houston, Texas. It discusses the elements and people that ultimately made the COTS model a success. Project Apollo: The Tough Decisions details the history of the manned space program from September 1, 1960 to January 5, 1968. It touches on the events that led to the Apollo mission program, the mission that established the United States’ presence in space after it had been working so hard to catch up with the Soviet Union. The book includes the major individuals and decisions that contributed to the world’s first manned lunar landings. A Researcher’s Guide to: International Space Station Earth Observations highlights the purpose of NASA’s Earth science program and explains why it’s important to develop a scientific understanding of Earth’s system. Readers will learn about NASA’s detailed research and long-term observations of Earth’s surface, biosphere, atmosphere, and oceans so that they can better predict climate, weather, and natural hazards. Archaeology, Anthropology, and Interstellar Communication Addressing a field that has been dominated by astronomers, physicists, engineers, and computer scientists, the contributors to this collection raise questions that may have been overlooked by physical scientists about the ease of establishing meaningful communication with an extraterrestrial intelligence. These scholars are grappling with some of the enormous challenges that will face humanity if an information-rich signal emanating from another world is detected. By drawing on issues at the core of contemporary archaeology and anthropology, we can be much better prepared for contact with an extraterrestrial civilization, should that day ever come. Remember, on the next Meteor Day or any other summer night when the skies are clear, to take a few minutes for some star-gazing, and perhaps even make a wish! About the author: Tiffane Tingle is a Student Intern in GPO’s Library Services & Content Management. This entry was posted on Thursday, July 16th, 2015 at 3:37 pm and is filed under NASA, Naval Observatory. You can follow any responses to this entry through the RSS 2.0 feed. You can leave a response, or trackback from your own site.